F/L Chris House in his early RAF career. 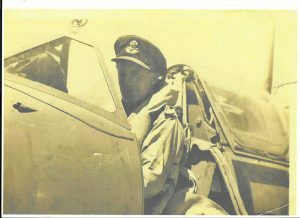 On the 1st April 1945, Flight Lieutenant Chris House walked out to the Hawker Typhoon he would be flying on ops that day. XP-W was painted on her side and ‘Sheila’ on her nose. She was four months old and she had been damaged and repaired over 18 times. As Chris walked out that spring Sunday, he and RB396 would be leaving the safety of Germany and heading to the dangers of Holland. Such is war. Chris House had joined the RAF by mistake. Chris’ grandfather had been recommended for a VC in the first war and Chris had intended to follow his family into the army but a pretty decent pub crawl led to Chris signing up in the wrong recruitment office. His father was less than pleased. Following training in Canada, Chris’ career took him to North Africa flying Hawker Hurricanes. Amazingly, Chris’ logbook shows him flying a ME-109 on a mission, which he never spoke about. Chris force landed twice while on operations in North Africa before returning to Europe. He requested a transfer to a Typhoon squadron and on 25th March 1945, he joined 174 Squadron. Chris had only been flying with 174 Squadron for 6 days when he took RB396 up on that spring day. Chris and RB’s mission that day took them to near to a town called Lingen in Lower Saxony. As Chris released his rockets, he and RB were hit by flak. Rapidly losing height, Chris forced landed RB north east of Denekamp in Holland and, in his words, ‘did a runner’. He was on the run for three days, eating swedes he found. During his evasion, he was sheltered by a Dutch family. They gave him civilian clothes and passed him onto the Dutch Resistance. Tragically, the Gestapo found out about the family’s deed and they were executed for assisting Chris’ escape. 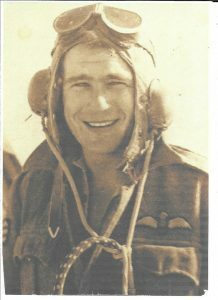 On the 3rd April, Chris returned to 174 Squadron at B.100 Goch. His CO noted, ‘Depression lifted slightly today when House was known to be safe and on his way back. Poor Chris looked nearly exhausted when he came in but what an adventure.’ Chris house would transfer to 175 Squadron when 174 was disbanded. He would fly with 175 Squadron until the end of the war and stay on in the RAF and fly Vulcan bombers. Chris would retire from the RAF in the 1960s, eventually settling in Cornwall with his fishing boat. RB396 would remain where Chris left her and eventually her journey would return her to England nearly 70 years later. We are about to announce a major milestone for the rebuild of RB396’s fuselage. Keep an eye out for our Crowdfunder which we will be launching soon specifically to support the work on RB. You can also support RB396’s return to European skies, and be kept update date with all the latest developments first, by joining the Supporters’ Club. Click the banner below to find out more.